We’ve been working hard over the summer to implement some new initiatives on our end that we hope will make for the best school year yet for LAPS staff and students. One of those things is our new website – we hope you like it and find it useful. For teachers, we have put all our grant application forms online. If you would like to apply for a grant from the Foundation, it should just be a click away. Remember, we will be accepting grant applications September 1-28. We look forward to hearing what ideas you have for your students, professional development opportunities that have caught your eye, and the books you are considering for professional book groups. Last year we proudly facilitated the infusion of over $75,000 in donations to the Los Alamos Public Schools. Nearly $20,000 of that went to support professional development and staff appreciation, which is something the Foundation firmly believes in. 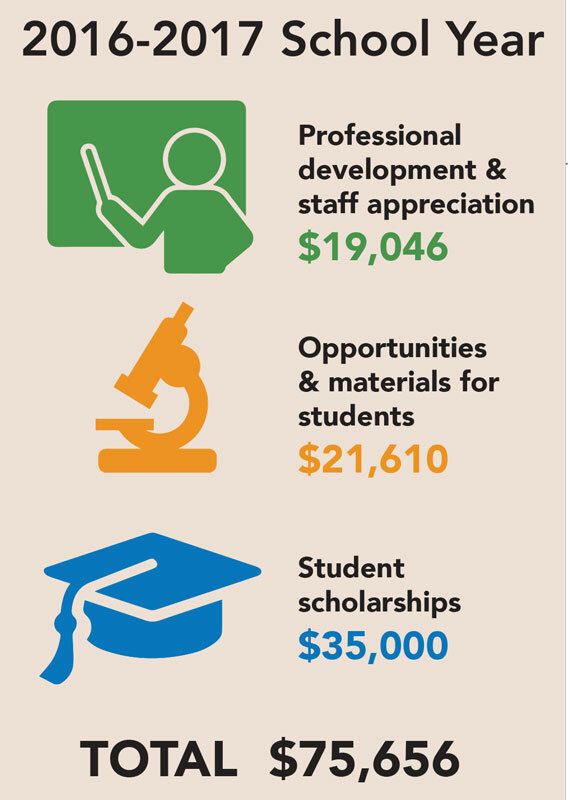 Over $21,000 supported opportunities and materials for students, ranging from Robotics equipment, to special books, to a coffee bar that not only helped student learn life skills, but it boosted staff morale with a simple cup of coffee and a smile. The remaining $35,000 funded scholarships for some pretty amazing LAHS graduates. The thing about the Foundation is, the more money we raise, the more we can do for Los Alamos Public Schools. So, a new feature of our website is an easy tool for donating to the Foundation. This new tool gives our donors more flexibility – you can even sign up to charge a certain amount to your credit card automatically every month without having to give it a second thought. So, as the new school year rolls around, we hope you will consider supporting the Foundation in whatever way makes sense to you. Thanks for your support! Next Next post: Teachers, What Can We Do for You?